Over the past two decades, researchers have confirmed what comedians have known forever: Men don’t like to ask for directions, and women like to have confirmation and do things in the company of others. Men are from Mars and women are from Venus. These fundamental stereotypes especially show up in the different ways these two groups approach finances. One thing I have learned in my 25 years in the financial industry is the way men and women manage, view and process information they receive about money, seems to be in two different universes. 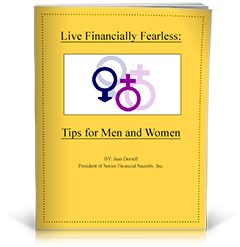 Please fill in the fields below to download your copy of ‘Living Financially Fearless: Tips for Men and Women’.